Hooray! It was a GREAT 100th day! 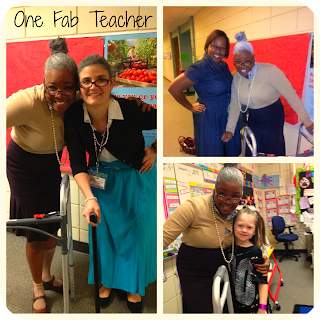 The 100th day of school is one of my favorite school days of the year. My "Firsties" were so excited about this day before it even came. As we would do calendar and count the number of days of school they would become so eager more and more each day. Especially, around the 95th day. LOL!! 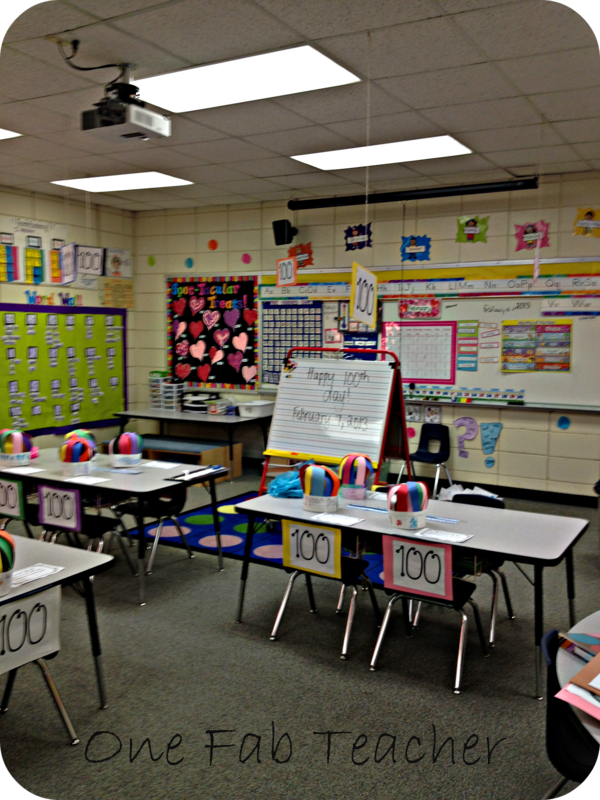 So this year I decided to decorate my room with 100's all over our classroom. I hung them from the ceilings and I posted them on the back of their chairs. The day before we created 100 day crowns. Waiting on their table for them was a certificate that said, "Hooray I'm 100 days smarter." They simply LOVED it!! Every morning at our school every teacher stands outside their classroom doors ready to greet each and every child entering the classroom. I think this is a FABULOUS idea. It really sets a tone for the day. I greet my students with a good morning and a hug. Well on this day my grandmother (me) Mrs. Pearl was waiting for my firsties. The looks on their faces were so priceless. I even had some of my firstie parents fooled. 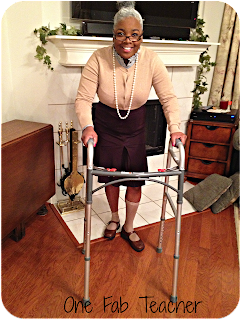 One emailed me and wrote, "Miss May I thought that was really your grandmother visiting today, you rock!" I cracked up. I had emails saying how kids were so happy and excited about meeting Miss May's grandmother. I had one parent who said her firstie explained, Miss May's "grandmudder" was at school and she was nice. Let me tell you I was really into character. I always said if I didn't teach I would definitely be in Hollywood acting. LOL Watch out Halle Berry!! My precious firsties were so good to me (aka Mrs. Pearl). I never told them to this day that it was me. Why? They're only in first grade once. That's a memory that I hope they will always carry with them. Days like this make teaching so much fun! Happy 100 day! So here is a #picstitch I created on that great day. The left picture is my "Firstie" teammate Mrs. Minnie was her name. I just simply LOVE her. I was our 2012-2013 Teacher of the Year and she will be our 2013-2014 Teacher of the Year. Go "Firstie" Teachers!! The top right is a good buddy of mine Kerri who teaches 4th grade. She wanted a picture with Mrs. Pearl. Lastly, the bottom right picture is myself and my one of many sweet firsties. Her mother teaches here as well and is a really great friend of mine. I though that it would be a great idea to take a picture with each of my firsties and send a copy to their parents. It made their day. I would love to hear about your 100 days! !